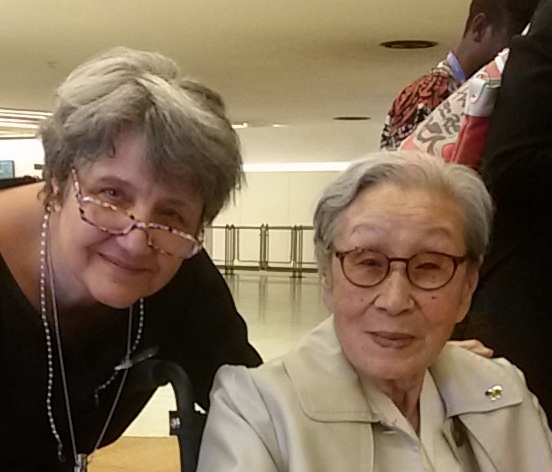 The Korean Council and a 91 year old survivor Bok-dong KIM attended the 32nd UN Human Rights Council held in Geneva, Switzerland. During that visit, the Korean Council and Bok-dong Kim met with the High Commissioner for Human Rights, Special Rapporteur on Violence against Women and other UN human rights secretariat. On June 17, the side event titled “The Right to a Remedy and Justice for Survivors of Japanese Military Sexual Slavery” was held. Frances Raday, Chair of the Working Group on the issue of discrimination against women in law and in practice criticized the KOR-JPN agreement on the “comfort women” issue at the event. Indeed, CEDAW and Special Procedures’ experts consider that this agreement does not represent an unequivocal official apology from the responsible stakeholders. Despite expressing regrets, they only recognized the involvement of the Japanese Government and military army in the perpetuation of the sexual slavery crimes against thousands of women and girls prior and during WW∥; surviving victims were not consulted and neither were the organizations defending their interests and rights in the preparation of this agreement. It therefore does not take into account the victims’ requests formulated over the past decades; the agreement does not meet the demands of the victims with regard to reparation – they have been asking for individual compensation while the agreement plans that Japan will make a donation that will be used for bilateral projects, including a foundation to be set up by South Korea; the agreement mentions that this is a “final and irreversible” solution to the issue of “comfort women”, while it denies victims’ right to justice, truth, reparations and redress. Finally, the Republic of Korea agreed to consider the removal of a statue commemorating the struggle of the so-called “comfort women” in Seoul.